We are the topmost wholesaler and trader, involved in offering a comprehensive range of Servo Voltage Stabilizer. This product protects the electronic appliances from being damaged, due to voltage fluctuations. Marsun voltage stabilizers are the high-tension stabilizers, manufactured with a view to protect electrical equipment from overloading of voltage. Well-fitted for various industries and applications, our voltage stabilizers can supply and constant and stable input voltage to meet your needs. They are best to be utilized to provide continuous output voltage as well and overcome the issues of voltage fluctuation. As a popular Servo Stabilizer Manufacturers we use hi-tech technology and quality raw materials in order to provide customers with automatic voltage regulators that come equipped with the feature of managing load conditions and wide voltage fluctuating ranges. Our engineers integrate solid state into the voltage regulators’ controllers that hat enable the machine to send signals to the controlling servo voltage stabilizer motor. In addition this, it drives the roller mechanism in a specific direction to bring the voltage equivalent to the rated output voltage. At Servokon, we manufacture servo stabilizers mainly to meet the requirements of industries. 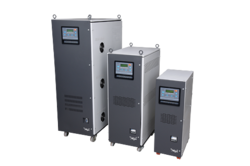 Looking for Servo Voltage Stabilizer ?